A young coastal brown bear cub walking towards me, Katmai National Park, Alaska. 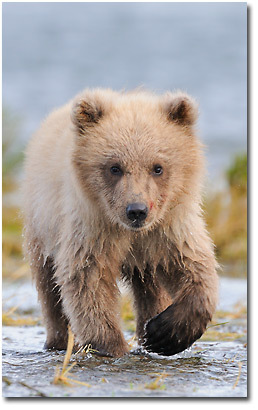 Brown bear photo tours. This tour I’m super excited to be a part of. I’m working again with Alaska boat captain Chuck Keim for a special one week adventure to Hallo Bay, Geographic Harbor and Kukak Harbor on the coast of Katmai National Park for an unforgettable week on this Alaska brown bear photo tour. This trip will be a first class tour, with myself and Chuck bringing you a combined total of nearly 30 years of Alaska bear photography and adventure. With the charter of Chuck’s boat Coastal Explorer, we’ll have the mobility to go up and down the coast of Katmai National Park, exploring world famous Hallo Bay, Kukak Bay and possibly even venturing over to Geographic Habor. This provides us with unsurpassed opportunities to photograph brown bears in a myriad different environments. The possibility of photographing 50-60 or more bears on this photo tour is not at all unreal. With all flexibility and mobility of the boat and a small skiff, we can run ashore whenever we choose, when the light is good, when the bears are out and active. We’re not limited to any particular location or beach, as is the case at so many other brown bear photo tours. Trip options: Explore Hallo Bay, Geographic Harbor, Kukak Bay and the Katmai National Park coastline. Photograph bears clamming on the shore, grazing sedge grass, classic Alaska mountain settings. On this brown bear photo tour we’ll also have options to shoot bald eagles, puffins, possibly even wolves, though that is never a given. I now lead this tour with Greg Downing, of Naturescapes.net. There are 2 photo tour leaders and 8 places currently available for this tour. My fall grizzly bears photo tour is sold out and I am taking reservations for 2015 at this time. When it comes to wildlife photography and wildlife photo tours in particular, there is simply no beating experience and local knowledge. Not only have I been visiting the Alaska pensinsula for almost 15 years now and shooting these great brown bears every year, I’m a professional guide. There’s a critical difference between being a photographer and a guide. This means these trips aren’t about me, they’re about you. They’re all about you, and the bears. My expertise is my commitment to promising you an extraordinary brown bear photo tour. The real beauty of this trip, as if 50 plus bears and snow-capped peaks and bald eagles and puffins aren’t enough, is having Chuck along. I did my homework here, and searched for the right click; there’s simply no one else who has Chuck’s expertise, as a captain and a bear guide, and this combination is something that is just not found everyday. I keep group size to a minimum; rather than stay in a lodge that caters to 50 guests at one time, this trip will be no more than me plus 5 photographers. There are currently only 4 spaces left, and one of those is tentatively booked; so I expect this photo tour will fill up asap. To get in touch and talk about what you’re looking for in an Alaska brown bear photo tour, what your needs and goals are, please send me an email or call 770. 952 4549 and I’ll be back in touch with you as soon as I can. For a host of info on this brown bear photo tour, either email me below or visit Expeditions Alaska for all the details. Thanks so much, this will be a blast!